The other night, I was watching Julien sleep, and couldn't help but think back to when he was born. I imagine because of all the pregnancy hormones, and progressing in the pregnancy that maybe this is the reason for it popping into my mind often now. And I must say, I truly feel blessed to be this little boys mom. To be able to watch him grow and learn. It is so amazing, and I think of how far we have come as a family. Julien was quite ill when he was born, and I thank God everyday that he overcame it. I was induced early because of high blood pressure leading to pre-eclampsia. 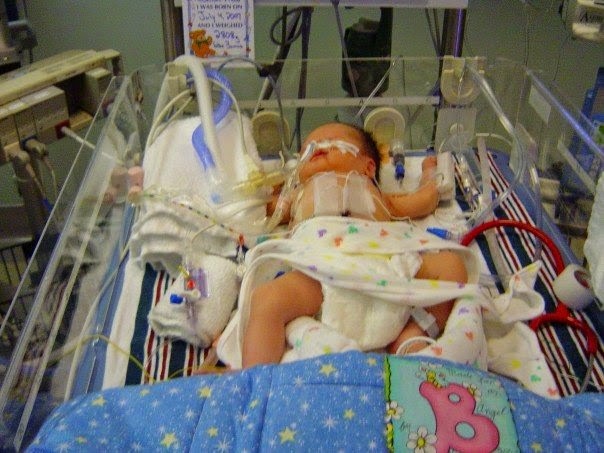 They expected that he would have some breathing issues since he was to be born early, and had prepared us for the fact that he would need to be in the special care nursery for monitoring. However, when he was born it was worse than they thought. His lungs had not developed fully in the womb, and he was missing the serphactum that helps to keep the lungs inflated. The way the pediatrician on call explained it to us, was that it's like blowing up a balloon for the first time - it's difficult, but once blown up much easier to get it going again. So, without the serphactum, each breath Julien took was like the first time blowing up a balloon. He did tell us that often times they will develop it on their own within 24 hours. So, we wait. Well. about 18 hours later he comes to see me, and tells me that Juliens condition is worsening. He is having more trouble breathing, and they need to transfer him either to CHEO or to the Civic - as the queensway could not give him the care he needed. CHEO didn't have a transport team available for him, so Sick Kids in Toronto was going to come with their chopper and transfer him - but, they were unable to take off because of a lightning storm. Which meant we needed to wait another 3 hours until CHEO could get their to take him to the civic. 3am, CHEO arrives, and assess him. They were actually quite happy, as he didnt seem to be as bad as they had expected. We got to hold him and have some family time, and they took some pictures of us as well. I treasure these photos still. They left the queensway around 6:30 am, and J was to meet them there around 9am (they said that they needed to assess him further etc, so to go home and grab a shower/eat and then go). Well, when they arrived at cheo and were assessing him, his lung collapsed. They managed to get a chest tube into him, and reinflate the lung. It turns out that he had spontaneous pneumothorax - which means collapsed lung. This is apparently almost unheard of in newborns - and the doctors and RT's that I have spoken with in recent years are always fascinated becaua=se they have never heard of it happening in a newborn. Sometimes if they are being bagged the pressure will cause it to collapse, but not spontaneously. I thank God that the ped had called for the transfer when he did, as had this happened at the queensway, he certainly would have died, as they don't have the tools/instruments to deal with these issues. Watching him sleep the other night made me realize just how blessed we are to be this little boys family.